Agave plants are succulents that only flower once in their lifetime, usually after about 10 to 50 years. Commonly known as century plants due to their long period of growth before blooming, agave die after producing blossoms on tall flower spikes above their foliage. Gardeners value agave plants for their thick, attractive leaves and their use in border plantings. Hardy to zone 9, most species of agave cannot tolerate frost or cold temperatures. In cool climates, gardeners grow agave plants in containers for easy transport indoors when temperatures drop. Choose a planting site for agave that receives full sunlight throughout the day. Spread a 2-inch layer of manure over the planting site, and use a garden tiller to incorporate the material into the soil to provide adequate drainage and fertility. Use a shovel to dig a hole in the soil twice as wide and of equal depth to the plant's root ball. Place the root ball directly into the hole and cover gently with soil. Water lightly just after planting to collapse any air pockets. Space agave plants 3 to 4 feet apart. Water agave plants once every four days for the first month of growth to encourage establishment of the root system. Reduce the frequency of watering during spring, summer and fall to once every 10 days and once every two weeks during winter. Feed once per year in early spring, just before new growth begins. Use a slow-release fertilizer to provide a steady supply of nutrients throughout the growing season. Apply following the manufacturer's instructions for the best results. Prune agave plants once per year in late winter, just before new growth begins. Remove dead and diseased leaves to increase the aesthetic appeal of the plant and prevent the spread of illness. Always wear gloves when handling agave, as the sharp leaves may cause injury. Grow agave in a container filled with a well-drained succulent potting mix in zones 1 through 8. Place in an area that receives full sun and follow the same care instructions for outdoor plants. Bring indoors when temperatures drop below 50 degrees Fahrenheit and place in a brightly lit window until temperatures rise in spring. 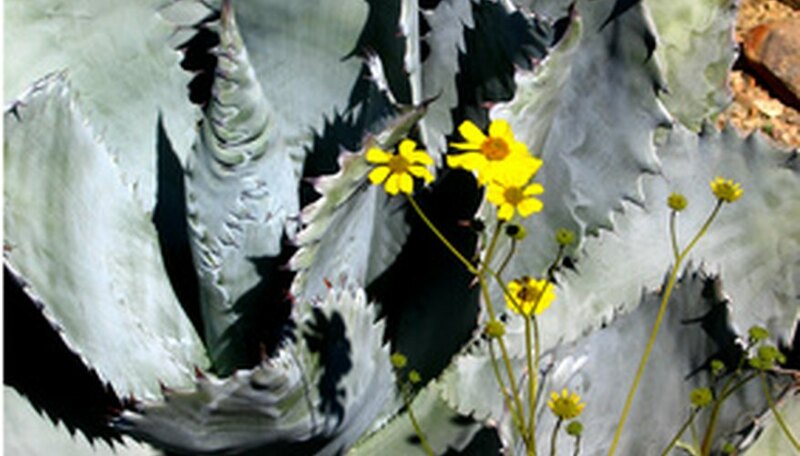 Small or very young agave plants benefit from filtered sunlight. Place container-grown agave in bright, indirect light until they become established and new growth is observed, and then move into full sun. Outdoors, protect newly planted agave from the sun until established using a board, umbrella or other temporary shade structure. Do not disturb the roots when planting as they are fragile and significant damage can occur. Do not remove any living, healthy leaves from the plant as this will increase the chance of infection.